Hey friends, it is Odie again today. We had a wonderful week in Wichita. It is always great to see our long time friends, and make new friends along the way. Today we plan to leave for Omaha! That is exciting. 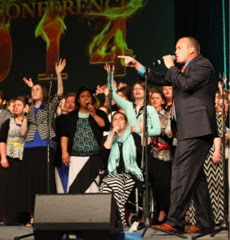 Last fall I was asked to be apart of a Mass Choir at Pentecostal Fire Youth Conference 2014. It was directed by Bro. Randall Walls of Richlands, Virginia. We had over 150 voices representing many states. It was a honor to represent Ohio. I was joined by 6 others from Ohio; Whitney Ward, Hannah Lloyd, Deidre Boggs, Jeremy Margeson, Anna and Seth Hoover. The choir practiced Friday afternoon of PFYC and sang that evening. It all really came together very good. The Walls family are very talented. They direct the choir at Richlands Tabernacle and do an amazing job. You can find their music on YouTube. We sang 2 songs Friday night. Lord You Are The Potter and He Got Up. This clip of Lord You Are The Potter is on YouTube. 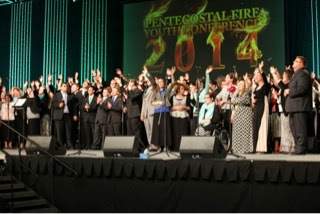 I found these pictures of the Mass Choir on www.pfyconline.org. Check out PFYC online and make plans for 2015. It will be Thursday and Friday Mach 26th and 27th. I know it will be wonderful. I am already excited about next year. They have great line up of speakers scheduled. Have a good weekend. See you next time. Thank you very much for continuing to pray for me.